For more than a year, Syria has been in the news due to the horrific civil war that has torn it apart and inflicted misery and suffering upon its civilian population. 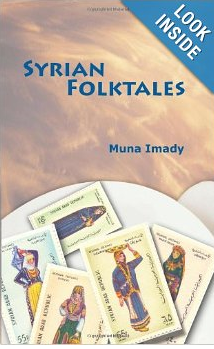 In Syrian Folktales, the reader is introduced to a different perspective. Muna Imady grew up in Syria. She presents the tales of her oral heritage beginning with the words “once upon a time…” ( Kan ya ma kan), that were passed down to her by her grandmother. (Tete) The author provides the reader with a glossary of Syrian terms for reference. In the overview, Imady informs us that Syria is a country with a population of eighteen million spread out into fourteen distinct administrative units called Muhafazat. The Syrian Arab Republic lies at the crossroads of trade routes linking Africa, Asia and Europe. Turkey lies to its north, Iraq to its east, Jordan and Palestine to the south, and Lebanon and the Mediterranean Sea to the east. The author divides the book by these fourteen areas. Not only does she present a folktale or two for each of them, she entices us with recipes, riddles, street peddler songs, and a Hadith. What is a Hadith? It is a saying from the Holy Prophet of Muslim. Here is one of the riddles: I come from water and I die in water. What am I? I will retell a folktale from Dara’a, a province that contains many archaeological sites which date back to Roman times aptly titled, The Sky is Raining Meat. The tale tells of a farmer and his wife who live an ordinary but comfortable existence. There is one big problem. The wife talks too much. One day the farmer finds a jug full of gold coins. He is afraid that the landlord will discover his good fortune so he buries the jug. Then he secretly kills and cooks a sheep. Next he ascends to the roof of his dwelling and throws chunks of meat from the roof. His wife observes his strange behavior but happily runs to gather up the meat. Later, the farmer takes his wife to the place where he buried the coins and tells her of their good fortune. Sure enough, the wife begins to spread the good news. The landlord arrives to demand the gold. When the wife informs him, they found the gold the same day that the sky was raining meat, the landlord decides she must be crazy! After that day no one believed anything the wife said. The farmer and his wife lived happily ever after. Many of the tales from Syria bear similarities in characters and themes to those of Western culture. There are tales of the raven and the fox, a wicked stepmother, the sly fox, a woodcutter, dragons, witches, and three pigs. While reading though them, I was reminded of The Frog and the Prince, Snow White, Cinderella, and Beauty and the Beast. Imady has done an admirable job in presenting the traditions of this region which date back to the fourth millennium B.C. Parents and teachers who want to explore what Syria is really about should take a look. Appropriate for children age ten and above. If you enjoyed this post, please subscribe by clicking on Follow or the orange RSS feed button in the upper right hand corner.